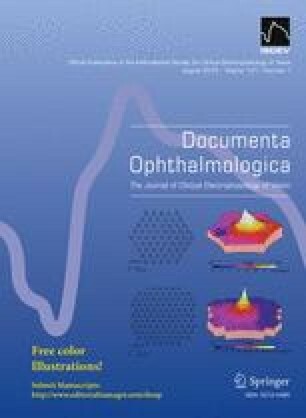 To evaluate the influence of ranibizumab on the multifocal electroretinogram (Mf-ERG), full-field electroretinogram (Ff-ERG) and optical coherence tomography (OCT) in diabetic eyes (n = 20) with macular oedema. In 20 eyes (20 diabetic subjects) with no or background diabetic retinopathy and macular oedema (age 65.7 ± 9.8 years, duration 16.5 ± 10.0 years), the change in ETDRS letters, Mf-ERG, Ff-ERG and OCT was analysed, at baseline, 4 weeks after the first injection, (just before the second injection), and 4 weeks after the last injection with ranibizumab. From baseline, mean BCVA improved from 64.0 ± 10.0 ETDRS letters to 75.0 ± 7.3 ETDRS letters (p = 0.005) 1 month after the last injection. Mean OCT thickness reduced after the first injection from 418 ± 117 to 311 ± 126 µm; (p = 0.001) and to 302 ± 74 µm after the third injection. Mf-ERG demonstrated in the innermost three rings a shorter implicit time after the first injection with p values of 0.002, 0.005 and 0.017, respectively. After the third injection, implicit time was prolonged to almost the original levels. Cone implicit time with 30-Hz flicker improved significantly between baseline (35.5 ± 3.6 ms) and final follow-up (34.6 ± 3.1 ms) (p = 0.04). Though the central retinal thickness was reduced after three injections of ranibizumab and the subjects gained a mean of 11 ETDRS letters, there was no significant change in amplitude or implicit time in Mf-ERG. The shortened 30-Hz flicker implicit time might imply that ranibizumab has no negative impact on the entire peripheral cone function, but can improve it instead. This study was supported by Novartis Sweden AB.